In 1996, EMS leaders and visionaries from across the United States joined together and wrote the EMS Agenda for the Future. This document has guided and directed the development of the profession for the last twenty years. In 2016, the NHTSA Office of EMS announced a project to update this document. The EMS Agenda for the Future is a strategic plan and needs assessment to guide the development of Emergency Medical Services (EMS) into the twenty-first century. The Agenda examines what has been learned during the past three decades and creates a vision for the future of EMS. This vision comes at a time, when agencies, organizations, and individuals who affect EMS are evaluating their role in the context of a rapidly evolving health care system. The National Highway Traffic Safety Administration (NHTSA), the Health Resources and Services Administration, together with the National Association of State Emergency Medical Services Directors and the National Association of EMS Physicians and others, realized the need to develop an EMS Agenda for the Future. This document is a guide for EMS providers, health care organizations and institutions, government agencies, and policy makers. The development of the vision included the appointment of a steering committee, representing a cross-section of the EMS community, the scheduling of focus groups and the distribution of the draft document to some 500 interested EMS organizations and individuals for extensive peer review. A Blue Ribbon Conference held in December 1995 brought the EMS community together to finalize the vision for the future. The EMS Agenda for the Future serves as guidance for EMS providers, health care organizations and institutions, governmental agencies, and policy makers. All must be committed to improving the health of their communities and to ensuring that EMS efficiently contributes to that goal. They must invest the resources necessary to provide the nations population with emergency health care that is reliably accessible, effective, subject to continuous evaluation, and integrated with the remainder of the health system. Expand the role of EMS in public health and prevention. Involve EMS in community health monitoring. Integrate EMS with other health care providers and provider networks. Be cognizant of the special needs of the entire population. Emergency medical services (EMS) of the future will be community-based health management that is fully integrated with the overall health care system. It will have the ability to identify and modify illness and injury risks, provide acute illness and injury care and follow-up, and contribute to the treatment of chronic conditions and community health monitoring. This new entity will be developed from redistribution of existing health care resources and will be integrated with other health care providers and public health and public safety agencies. It will improve community health and result in more appropriate use of acute health care resources. EMS will remain the public’s emergency medical safety net. To read the complete document click here. The Education Agenda is a vision for the future of EMS education, and a proposal for an improved structured system to educate the next generation of EMS professionals. The Education Agenda builds on broad concepts from the 1996 Agenda to create a vision for an education system that will result in improved efficiency for the national EMS education process. This system will enhance consistency in education quality and ultimately lead to greater entry level graduate competence. The proposed system maximizes efficiency, consistency of instruction quality, and student competence by prescribing a high degree of structure, coordination, and interdependence among the five components. A key benefit of this systems approach will be an enhancement of the consistency of instructional quality achieved through an interaction among three system components, the National EMS Education Standards, National EMS Education Program Accreditation, and National EMS Certification. At the higher levels of education, this strategy for ensuring consistency allows the use of less prescriptive National EMS Education Standards in place of the current National Standard Curricula (NSC). With less dependence on a prescriptive NSC, instructors will have greater flexibility for targeting instruction to specific audiences, resulting in enhanced comprehension and improved student competence. The Education Agenda describes an interdependent relationship among the five system components and recommends specific lead groups for development and revision responsibilities. The National EMS Core Content is a comprehensive list of skills and knowledge needed for out-of-hospital emergency care. Specification of the Core Content is primarily a medical concern and will be led by the medical community, with input from the system regulators, educators, and providers. The National EMS Scope of Practice Model divides the National EMS Core Content into levels of practice, defining minimum knowledge and skills for each level. Since this determination is fundamentally a system issue, the system regulators will have the lead in its development, with input from the other stakeholders. The National EMS Education Standards take the place of the current National Standard Curricula, specifying minimum terminal learning objectives for each level of practice. Being basically an educational task, the development of the National EMS Education Standards will be led by educators, with input from other stakeholders. National EMS Education Program Accreditation is applied to all nationally recognized provider levels and is universal. Accreditation is the major mechanism for verifying educational program quality for the protection of students and the public. Accreditation enhances the consistency of the evaluation of instructional quality. National EMS Certification is available for all nationally recognized provider levels and is universal. Certification involves a standardized examination process and contributes to the protection of the public by ensuring the entry-level competence of EMS providers. In order to be eligible for National EMS Certification, a student must have graduated from an accredited program. Administratively, the system proposed in the Education Agenda offers a number of benefits, including greater predictability for component development cycles and a clear and definite method for introducing changes to the system. These provisions will clarify the process for accommodating medical advances, technology development, and other needs that affect the scope or content of EMS education while following the recommendations of the 1996 Agenda. The National EMS Scope of Practice Model is a continuation of the commitment of the National Highway Traffic Safety Administration and the Health Resources and Services Administration to the implementation of the EMS Agenda for the Future. It is part of an integrated, interdependent system, first proposed in the EMS Education Agenda for the Future: A Systems Approach which endeavors to maximize efficiency, consistency of instructional quality, and student competence. The National EMS Scope of Practice Model supports a system of EMS personnel licensure that is common in other allied health professions and is a guide for States in developing their Scope of Practice legislation, rules, and regulation. States following the National EMS Scope of Practice Model as closely as possible will increase the consistency of the nomenclature and competencies of EMS personnel nationwide, facilitate reciprocity, improve professional mobility and enhance the name recognition and public understanding of EMS. The National EMS Scope of Practice Model defines and describes four levels of EMS licensure: Emergency Medical Responder (EMR), Emergency Medical Technician (EMT), Advanced EMT (AEMT), and Paramedic. Each level represents a unique role, set of skills, and knowledge base. National EMS Education Standards will be developed for each level. 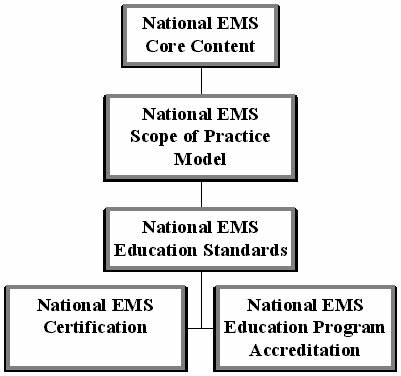 When used in conjunction with the National EMS Core Content, National EMS Certification, and National EMS Education Program Accreditation, the National EMS Scope of Practice Model and the National EMS Education Standards create a strong and interdependent system that will provide the foundation to assure the competency of out-of-hospital emergency medical personnel throughout the United States. Despite the lifesaving feats performed every day by emergency departments and ambulance services, the nation's emergency medical system as a whole is overburdened, underfunded, and highly fragmented, says this series of three reports from the Institute of Medicine. As a result, ambulances are turned away from emergency departments once every minute on average and patients in many areas may wait hours or even days for a hospital bed. Moreover, the system is ill-prepared to handle surges from disasters such as hurricanes, terrorist attacks, or disease outbreaks. Hospital-Based Emergency Care: At the Breaking Point explores the changing role of the hospital emergency department and describes the national epidemic of overcrowded emergency departments and trauma centers. Emergency Medical Services At the Crossroads describes the development of Emergency Medical Services (EMS) systems over the last forty years and the fragmented system that exists today. Emergency Care for Children: Growing Pains describes the unique challenges of emergency care for children. The evolving role of EMS as an integral component of the overall health care system. EMS system planning, preparedness, and coordination at the federal, state, and local levels. EMS funding and infrastructure investments. EMS workforce trends and professional education. EMS research priorities and funding.